ARI SHOWED AT THE 2015 EMPIRE/NEAOBA SHOW! 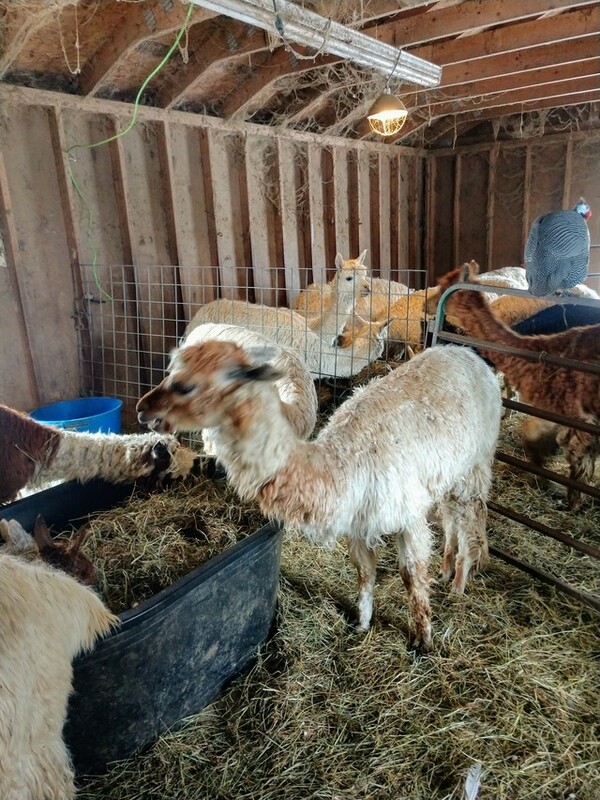 At 9 YOA, he'll not likely beat any 2-year olds, but this is a great opportunity to see what an aging male should look like and what to expect for fleece production, not to mention his sweet temperament (he was shown by my 9-year old neighbor for her first alpaca show). Check out his uniformity, his consistent lock structure and his record of micron progression over time. Arioso ("Ari") is an absolutely beautiful show-quality white suri male with perfectly formed, twisty "pencil" locks, glow-in-the-dark luster, and patches of fawn that set off the purity of his white locks. Ari's conformation is square and straight, another compact, typey suri sired by The Colonel. His fleece has a cool, slick handle as a well-fleeced suri should. Coverage extends from his topknot to his toes, with a bearded chin and beautiful pearly locks on his neck and chest. He has definitely inherited the extraordinary relocking capacity that The Colonel's offspring have all exhibited; his third fleece is absolutely fantastic and we're delighted that judge Tim Lavan agreed! Arioso's exceptional quality, however, is his uniformity. His fleece has the same style, length, luster, lock and handle from his topknot to his tail and down his legs. One of the qualities that nearly always need improvement is uniformity, and we'll be using Arioso to bring that quality to our best unrelated females. Ari's first cria was born 8/27/09 - a lovely white female with fawn muzzle and a fawn spot on her head. 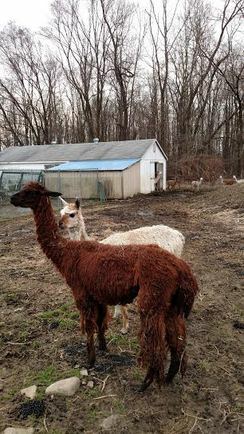 Her dam is not the best conformed alpaca in the world, with her short, squat body; however, Ari's cria, Calypso, is absolutely perfectly conformed, so Arioso can definitely be said to improve upon the dam. In addition, Calypso is adorned with the same fantastic lock structure, handle and uniformity that Ari displays. Since her birth, he has thrown a number of equally high-quality offspring. Ari has an absolutely charming temperament and personality. He stands quietly for injections and even allows his legs and feet to be handled with no fuss! This type of easy-to-manage temperament is a very important quality to have across a herd, and one that Arioso has the capability of producing for you. Ari has tested negative for BVD and Brucellosis. This fabulous gal has the color genetics we're all looking for, and produces the most extraordinary offspring! In 2009, it was a 23-pound MF/W/LSG male! We knew she could throw gray, and Mozart proved it. In 2010, she gave us a gorgeous MB boy whom we're calling "Gus" for modern composer Gustav Mahler, and in 2011 she produced a fabulous TB male we've named Blackjack. All of her crias have exceptional fiber architecture, excellent handle and pleasant personalities. Mo is an experienced and protective dam who consistently throws crias with stature, elegance and conformational perfection. Mo's 2012 contribution to our herd was a beautiful dark fawn male sired by Big Bad VooDoo Daddy. As is the case with all of Mo's offspring, this new boy is well-conformed and this fellow, Lemony Snippet (Snips for short) absolutely blew me away with his fleece when I sheared him in 2013! Fiber like cobweb, as fine as gossamer! He will definitely be a superior breeding male. Mo can always be counted upon to produce a superior cria. Perhaps the most awesome of all, Mo produced our Firelord in 2016. This harlequin offspring is probably the most attractive, and one of the sweetest, crias ever produced on our farm. Mo is also "mother" to the herd. She continues to milk, and allows any cria (and any adult!) to nurse. 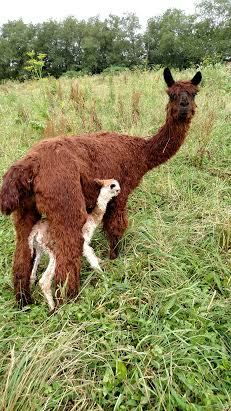 I did not rebreed her because while her willingness to nurse other crias can be a valuable contribution to any herd, I feared that continued nursing combined with gestation might be too hard on her. I expect that in a new herd, she will stop permitting indiscriminate nursing and regain the weight she has lost. Sally is the girl I've been waiting 6 years for! Her dam, Maureen, has given me 5 of the most exquisite male crias since I acquired her, and I knew if I could get a female from her, it would be worth the wait. It certainly way. Sally has grown up to be absolutely gorgeous, and with the qualities she inherits from both mom and dad, I know she will be a superior production female. I expect to breed Sally this summer. Her price includes this breeding. Buy now and choose your match.